A write-at-home-dad handling the daily crises of a <1 year old while mommy is at work. We all know games like Candy Land, Chutes (or Snakes) & Ladders, Sorry, Uno, or Monopoly. We probably played some or all of them in our childhood. Please don’t submit your children to the same fate! These are all outdated games with deep flaws that unfortunately continue to be passed down through generations simply because they’re the only board games people know, so I’m going to do my best to share a few better games that will hopefully fill the same hole these games do, but in a better way. Candy Land is effectively a variation of Snakes & Ladders, and in many respects, is not a game at all! Snakes & Ladders comes from ancient India where it was a teaching tool–an extremely crude simulation of moral life and the few virtues that give someone an advantage in becoming a good person (the ladders) and many moral failings (the snakes). To be sure, there is far more to Hinduism than this and I have nothing against India in any way, particularly not in the board gaming realm. Far too much of my youth was spent playing chess for that to be an issue! My problem with this game system lies in the fact that in every version of this game, absolutely no skill or strategy is required–everything is determined by chance via dice, cards, or a spinner. Of course, to many this may seem to be a good feature, since it gives very young children an opportunity to learn about taking turns, sportsmanship, counting, and (in the case of Candy Land) matching colors without overwhelming a child. Of course, nothing is wrong with any of those goals. They are all important things for everyone to learn as soon as possible. But can’t we do better for our children? Any game will teach turn taking and sportsmanship, and many can teach counting as well. There are countless better options for children, and I’ve talked about a few already on this blog. Today I’m going to go in a slightly different direction though and recommend a game that just came out last year (2012)–Dino Hunt Dice. Dino Hunt Dice is a reworking of Steve Jackson’s hugely successful Zombie Dice, with rules and a theme that are a bit more family friendly, along with smaller dice that are perfect for little hands. In this light push-your-luck game, players attempt to capture dinos for their zoo by rolling dice and hoping not to have the dinosaur foot icon showing that they’ve been stomped! It’s a lot of fun and any child that can understand the concept of rolling dice safely can play with some guidance from an adult. Older children will be able to pick it up and play completely on their own as well. If you’ve been stuck in the Molasses Swamp for the past 38 turns, you owe it to yourself, and especially your children, to try something new like Dino Hunt Dice. Recommendation: Dino Hunt Dice, designed by Steve Jackson, published by Steve Jackson Games. Sorry may be the game I am most disappointed to see people play. Yet another extremely random game, depending on what ruleset is in use ranging from completely random (like Snakes & Ladders) to marginally strategic play, its main result seems to be anger due to the completely unpredictable and uncontrollable results of play. If otherwise reasonable, well-mannered adults can completely lose their cool because they just were hit by ANOTHER bad card, how do you think a child whose emotional life is still developing will handle it? There is no reason to EVER play this game, because there is no reason to put that kind of ridiculous stress on the valuable family and friend relationships children are still developing. Why not play something everyone can enjoy? In the past 5 years or so, cooperative board games have become hugely successful, in my opinion largely because they give families and friends the opportunity to work together to overcome a seemingly insurmountable obstacle. In these games players are all working together to beat the game itself. Generally, players can only win in one way whereas the game can win in 2, 3, 4, or even more ways, forcing the players to work hard together in order to keep several bad things at bay while progressing towards their own victory. Forbidden Island is a fully cooperative game and great for families with even relatively young children. Players must work together to recover 4 valuable treasures from a mysterious island before it completely sinks into the sea. By coordinating their actions and helping each other out, everyone can win together in this exciting game. Best of all, this game is readily available at most Barnes & Nobles, Targets, and more at a very good price–probably less than a contentious set for Sorry would cost! Recommendation: Forbidden Island, designed by Matt Leacock, published by Gamewright Games. The newest game on this list of bad games, published in 1971, still manifests many of the horribly outdated design features other games on this list have–an infuriating lack of control of a player’s own fate and direct attacks by one player on another without any way to mitigate their effects–resulting in a poor experience for everyone. It’s a simple card game that can be played virtually anywhere, yet it requires a specialized deck of cards and has very little opportunity for skillful play. I don’t understand how it ever became as popular as it did when so many better options are available to be played with a standard deck of cards! I’m not sure what I can say about Uno that I haven’t already said about Snakes & Ladders or Sorry, other than that in our entire 6 years of marriage thus far, my wife and I decided to play Uno once and only once. Since we play so many new games, we thought it would be fun to revisit a game from childhood. Thirty minutes, an unfinished game, and several hurt feelings later, we sat on the couch and decided to never play that game again. Furthermore, this happened in the last year or two, when we had become very used to each other and how to play games with each other–this was no newlywed squabble! There is something about Uno that just lends itself to mean play, and I can’t accept that. Bohnanza on the other hand certainly can be played aggressively, but doesn’t require it, and even with aggressive play can still be ameliorated. Bohnanza has an unlikely theme: Bean Farming. However, thanks to the whimsical art on the cards, children will have a blast building sets of beans in order to cash in the most points while trading or giving cards to other players. That last part is in fact the key to the game–players must carefully keep all cards in their hands in the order in which they received cards. In order to maximise their sets, they must remove cards from their hands. Although Bohnanza is more complex than Uno and requires more skill and understanding on the part of children, they can still understand and enjoy the game, and I highly recommend it. It’s been a staple in my family for about 10 years now, and absolutely deserves a place in your home as well. Recommendation: Bohnanza, designed by Uwe Rosenberg, published by Rio Grande Games. Monopoly. Almost certainly the most prevalent board game in America, if not the entire English speaking world. The game that defines what a board game is to most Americans. Monopoly, a game rarely played by the printed rules and frequently remembered as interminable anger-fests as players go round the board time after time until everyone finally loses to the player who was clearly going to be the winner an hour or two ago. Surprisingly, I don’t hate Monopoly, as long as it is actually played by the rules. Even so, it still continues on for too long and I dislike player elimination in a game of this length. However, I can’t completely fault the rules because this is yet another classic game that in origin is a teaching tool. 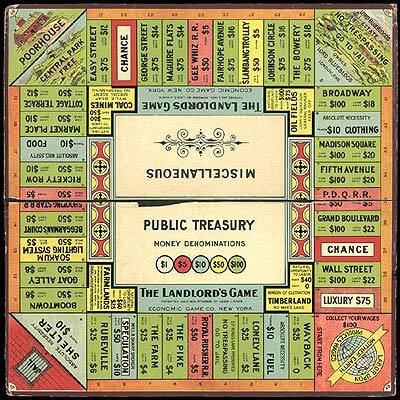 An early board of The Landlord’s Game–Monopoly’s direct predecessor. The first incarnation of Monopoly was called “The Landlord’s Game” and was invented by a socialist to demonstrate the evils of capitalism. I suppose it is possible for a game to be a good tool for teaching philosophy or political ideology while also succeeding as a game, but Monopoly does not. Furthermore, it’s frequently boring and unmistakably representative of its age. Gaming has progressed a great deal in the past 80-100 years, and with so many better games in the world, why bother with this clunker? The difficult part of replacing Monopoly is in finding exactly what it is that draws people to it, other than that it’s just the only game people know. Is it the set-building aspect? Zooloretto is a great alternative. Is it building an economic empire? In my opinion, Acquire is the greatest economic game ever made. Is it the auctions? Play For Sale, High Society, or Ra. Is it traveling around that familiar board and visiting your favorite places? Ticket to Ride does that by putting the board onto a map of America. Maybe you just like racing around the track to get that free $200–Formula D is a fantastic dice rolling racing game. All of the games I listed are excellent games, and could easily replace whatever it is that draws people to Monopoly, and I highly recommend them. Recommendation: Zooloretto, designed by Michael Schacht, published by Rio Grande Games; Acquire, designed by Sid Sackson, published by Avalon Hill; For Sale, designed by Stefan Dorra, published by Gryphon Games; Ticket to Ride, designed by Alan Moon, published by Days of Wonder; Formula D, designed by Laurent Lavaur & Eric Randall, published by Asmodee. I’m not saying that the games on this list should not exist. They all have historical value in the history of gaming, and even more so in the history of American pop culture. But please, do yourself (and your children) a favor, and don’t ever play these games again. Visit a local game store and check out some new games–I’m sure you’ll discover some new favorites! In college I was forced to take a class on leadership–I didn’t want to take it, I hated it while I was in it, and it has turned out to be the most useful class I took out of all 40-50 formal classes I was in during those four years. One thing I took away from that class is the importance of setting and meeting goals in all areas of life. Parenting is no exception! 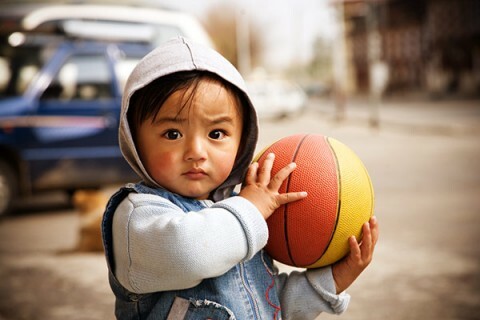 Small child or international basketball superstar in training? People have all sorts of goals for their children. For their child to have a certain career. For their child to reach certain achievements. For their child to have a safe and loving environment. For their child to have all the things they never had as a childhood. Some parents simply want to ensure their children have a childhood, instead of being forced into too many responsibilities too quickly. My goal is a little different though. To be honest, I really had not thought about my goal as a parent until talking with some friends whose oldest child is going to college this fall. They said–and I’m paraphrasing here–their goal was to develop their children into self-sufficient, independent adults. It’s such a simple thing really. Parenting philosophies abound today ranging from extremely regimented to extremely lax–or even creating a regimented system of lax ideas! But it seems obvious to me that childhood is by its very nature preparation for the rest of life, and I can’t believe I had never thought of it in such simple terms until that conversation. In fact, I have adopted that as my own goal as well–I want Sam to be able to cook, wash his own laundry, clean up after himself, teach himself new things, think critically and make up his own mind on issues, work hard, and create a meaningful and happy life for himself. To be sure I want all those other things too–like a happy childhood–but I have an achievable end-goal in mind. Don’t worry, Sam isn’t forced into cooking 5-course dinners for us! I don’t know if it would be beneficial for everyone to think through their goal as a parent, but I think it has for me. It’s certainly shaping the way I think about Sam and what I should and should not be doing for him and with him. Have you thought about your parenting goals? If so, what are they, and have they been successful and/or helpful to you as a parent? It’s National Library Week! All sorts of celebrations are happening in libraries across the country, including book giveaways, special guest events, and more. Now, it’s no secret that I love libraries. My dad was a librarian for most of his life, my uncle is a librarian, my wife is a librarian, I have lots of librarian friends, and I even worked in a library for over a year and a half. In fact, it boggles my mind that so many people don’t use their library. There are so many valuable resources at a library useful for children and adults–books; magazines; computers; genealogical material; dvds; audiobooks; music; both fun and educational events and materials; and best of all, the masters of finding whatever information you need, librarians. Behind that smile lies a mind ready and able to find whatever information you need–even if what you need is the connection between medieval siege warfare and Paris Hilton. Not that I have ever needed that information. No sir. The public library is a valuable resource for anyone, but particularly parents. Here are a few ways you can use that resource well. 1. Make use of story time. As a parent of a young child, you probably already know about story time, but it still bears repeating. Go to story time. It’s one of the highlights of Sam’s week! He loves going to the library and seeing the librarians and all the other kids that attend. There are songs, games, dances, puppet plays, and of course picture books read by expert readers. It’s great for your children to see and play with other kids, plus they will definitely have fun with the activity itself. 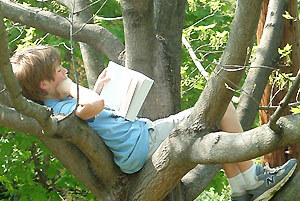 You can enjoy summer reading programs anywhere. 2. Join summer reading. Every public library in America is going to have a summer reading program. These can be great fun for your kids, even if they’re not old enough to read themselves yet. Parents can read to children and participate that way, winning prizes and having fun while enriching their minds. Furthermore, many summer reading programs also include special guests and events for children. There might be a special touring puppet show one week, a concert by a kids musician the next, a magic show the week after that, or even more. One year while I was working at a library, a truck-based aquarium came and parked in our parking lot for the kids to enjoy! Although they’re not as well known, most public libraries will also hold an adult summer reading program as well. You should definitely participate! There are still prize giveaways, special events, and more for you to enjoy as well, so plan to join in this summer. 3. Ask about other children’s programs. As I just mentioned, libraries have lots of great programs they put on themselves, like story times or summer reading. However, there are even more great opportunities for your child that you might never know about without asking. These could include Dolly Parton’s Imagination Library, after school programs, arts enrichment classes, and so much more. It’s a librarian’s job to know about these sorts of things, so ask away! I don’t think these kids think a library is boring, do you? 4. Socialize. If your idea of a library is a musty place where people will shush you for speaking above a whisper, it’s time to reevaluate your conceptions. Libraries are a great place to meet and talk with new people or just spend a nice afternoon playing a game. Although board games would be a great idea–I’ve got a few suggestions for you too–many libraries now even have video games for kids and adults to play. 5. Check out materials. This may seem obvious, but it bears repeating. Libraries are a great way to find great reading, listening, or viewing material. You can try things you might never have tried before–new genres, styles, authors, musicians, and more. Check out both fiction and non-fiction, books and dvds, audiobooks and music–you never know what you’ll discover, but your life will definitely be better for it. If you’ve never been to a library, give it a try. Spend some time at your local library this week. Wander through it. Ask a few questions. Check out something new. And above all, remember to thank your librarian. They work hard for you, whether you know it or take advantage of it or not. Enjoy your time there! I know you will. I am filled with wonder at Sam. Of course there are the new skills he has developed over the past 9 months that amaze me as he crawls, holds his own bottle, feeds himself, pulls up (although for some reason his mouth is an important aspect of his pulling up ability), and walks along the edge of the couch or from chair to chair around the table. Those things still wow me when I think about the tiny thing he was not so long ago. But it’s the little things he finds amazing that fill me with wonder. He loves to look out the window at our back yard. There’s nothing particularly special about our back yard, yet there is very little he finds more enjoyable than just looking at it for hours every day. 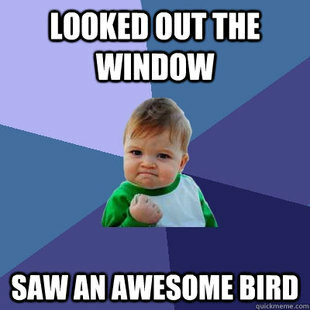 I inevitably lose interest after a few minutes and do other things while he continues to look outside. This seems to capture Sam’s thought process pretty well. Every time my face suddenly appears through a doorway or around an obstacle, he still smiles and laughs. We’ve been playing peekaboo for his whole life, but he still finds this game incredibly fulfilling. Even just turning his head and seeing me across the room will plaster a huge smile on his face. There’s something beautifully pure about childhood. We lose so much as we gain greater understanding and responsibility. I quickly decide that checking facebook or twitter is more interesting than seeking out the unique details of our back yard with Sammy. What do I gain from social media? Nothing really. But what could I gain from spending slow, quiet time contemplating the beauty of the natural world with Sam? What else deserves the type of intense attention to detail that Sam likes to give things? Probably one thing that deserves that attention to detail is my cleaning ability, which I type as Sam finds yet another cheerio I somehow failed to sweep up off the floor and he immediately pops it into his mouth. In all seriousness though, I think we gain as much from our children as they gain from us. Here I have been given a perfect example of how to live in deeper connection to my surroundings. It’s a beautiful thing, and I’ll try to make the most of it. Now, if you’ll excuse me, I’ve got a window to look through with my son. Early on in Samuel’s life, I couldn’t wait for him to reach a new milestone–holding his head up on his own, rolling over, sleeping through the night (oh, that was a blessed night indeed! ), and many more. Those milestones even caused me some minor angst, when I felt like his mom and I were not giving him a stimulating enough environment, since many of those milestones were reached away from home. Since then something has happened: mobility. Yes, Sam has been crawling for close to two months now, and I think crawling is in fact the biggest milestone of all. It’s the game changer. Lots of little milestones came together to help Sam transition from being an infant/newborn to a baby not only able to interact with other people, but a person who enjoys it; however, mobility itself is in many ways the first form of independence. It’s a great thing! The thing that concerns me at this point though is that I find myself simultaneously looking forward to new milestones and dreading them at the same time. Crawling is fun, but won’t walking be better, since he will be further away from all the dirt and dust on the floor? On the other hand, he will just be that much faster. I already can’t keep up with him and do everything else I need and want to do! Won’t language skills be great? He’ll be able to tell me exactly what he needs/wants, instead of me having to guess! And he’ll be able to talk back, say “no”, and trick me into arguments where his logic will never lose. Do I want him to continue growing and developing? Absolutely. Is it that I am trying to hold onto some perfect period in his life, where he is the most enjoyable? I don’t think so. I certainly don’t feel like this is a unique feeling either–I know billions of parents across time and space have had this mixed anticipation and trepidation. I guess what I’m trying to say is that although I have been aware of the tension of parenthood’s balancing act between what a child wants and needs and what the parents do, I had not yet experienced this other tension. This slow-moving tragedy. The tension between a parent trying to hold onto his old life and the child reveling in discovery, excitement, exploration, and the inevitable changes he creates in the world around himself. The change in family and interpersonal dynamics forged by sheer force of child willpower. Pondering my continued loss of control saddens me, but I think I may be missing the point. It’s not a tragedy at all. From the perspective of two and a half feet off the ground, it’s an adventure. Continuing last post, it’s important to recognize not just the importance of reading to your child, but also how to do it effectively. Reading is a skill that has to be learned, and reading aloud to a child is no exception. It’s easy to assume that reading to a child is just like reading to yourself, but there is a lot more to it than that! Reading to a child requires you to be an actor, a teacher, and a friend all at the same time. Let’s take a look at what that means. Instead, it just means that you have to put some feeling into your reading. It’s very easy to become monotone while you read to a child (particularly when you’re reading a child’s favorite book. Again. For the fifteenth time. This morning. 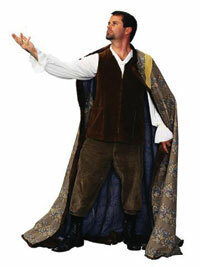 ), but they will enjoy the story far more if you try to stay engaged. When something surprising or sad happens, put that into your voice so it matches what is happening on the page. If you feel inspired, try making some special voices for different characters. You might not think you are doing a great job, but I promise your kids will love even the worst attempt at you making a special voice like a turtle! Finally, don’t forget to be a friend to your child while you read. There are many times throughout the day where we have to be the adults. We have to make sure children eat well; stay clean, healthy, and safe; and do things children need to do. But while you’re reading, just make the time to enjoy the book and the story together. Laugh together, talk about the story together, go back or jump ahead to a favorite part of the book, even stop reading for the moment if it’s not something that your child is enjoying. This is one time of day where you get to be on the same level as your child. Enjoy it! These aren’t the only ways of reading with a child, and different books and different children call for different styles. I know that I forget to do these things from time to time as well, and it’s ok if you do too. But I hope these tips will help you think about how you can read to your child more effectively, and ultimately that you will both enjoy reading even more than you already do with these ideas in mind. You all know I am passionate about childhood literacy, so much so that I am helping to start Dolly Parton’s Imagination Library in our home town. However, I want to talk a little today about why childhood literacy is so important. Here are some frightening statistics for you: Two thirds of children who cannot read proficiently by the end of fourth grade will end up in jail or on welfare. 37% of children enter Kindergarten without the skills necessary for lifetime learning. Or, the one that’s most disturbing to me, The US is the only nation out of 20 OECD free-market countries where the current generation is less well educated than the previous. This is not acceptable. This is not how any nation in the world should be, and we need to take steps to reverse these trends. Fortunately, reading to young children, making books freely and easily available to them, and encouraging them to be life-long readers can make a huge difference in their lives! Let’s look at some other studies too that show the value of reading to young children: A study of children aged 3-5 who were read to at least 3 times a week revealed that these children were two times more likely to recognize all letters, two times more likely to have word-sight recognition, and two times more likely to understand words in context. Creating a steady stream of new, age appropriate books has been shown to nearly triple interest in reading within months. The most successful way to improve the reading achievement of low-income children is to increase their access to print. How can anyone make up for it? Read to your children. Support childhood literacy programs in your community. Make a difference in the lives of children today. It’s been a while since I last talked about Dolly Parton’s Imagination Library, a fantastic non-profit dedicated to developing childhood literacy by giving children under 5 age-appropriate books at no cost to the children or their families. If you remember, I am working with a group to begin an affiliate in our county in Kentucky, and I wanted to give you all an update. This project began close to a year ago, when my wife, Emily, and I were talking with someone at church who also happens to work as an early education professor at the local community college. She asked if I would be interested in working with her on a literacy-based event, and I mentioned to her that I was interested in starting the Imagination Library in our community. She had heard of the program before and was excited to bring it to our town as well, but none of us were ready to jump in with both feet yet, since we were still expecting Samuel and in the middle of a school semester. So, about six months later, we began talking about this again and pulled the children’s librarian at our local public library into the loop, and we began planning in earnest. Our public library’s foundation agreed to be our “champion”–the non-profit entity that officially backs the program–and we began to talk to local business people and other community oriented groups to see who would be interested in serving on our board and donating funds. This has been tremendously successful, and we even discovered that one of our local rotary clubs was already working on starting the program themselves! We quickly and happily joined forces and funds and we are now planning a kick-off event for May, when we begin enrollment. We have a great deal of support from our local public library, rotary clubs, and chamber of commerce, plus we have begun talking to local businesses and government officials to continue raising funds and awareness of the program. I tell you this partly because I am so excited about our prospects and how this has progressed so quickly, but also to encourage you to become involved in your own local affiliate, or found one yourself. This is not terribly hard. People get excited about the program, in part because it’s so great on it’s own terms, but also because it’s an easy sell: Give kids books. Here in southern Kentucky, we’re excited about what we’re doing, and I guarantee that people will be/are excited about in your area too. Let me know if you have any questions by commenting below, and I encourage you to share literacy with the children in your life today. In keeping with the series on light psychology I’ve been doing, I spent some time considering the value of music recently. The concept that music is good for babies isn’t a new one. We’ve all heard about the studies showing that classical music has a positive effect on children–even if we know now that those studies had some major flaws. However, a more recent study has demonstrated the value of musical instruction even in very young children. It was no mistake that one of my earliest posts was a review of a music album. Music is universal and one of the oldest activities humans do–maybe that’s why it’s unsurprising that children love music so much. Sam is no exception! He loves hearing music at church, singing songs at home, listening to CDs in the car. Recently, a friend came to our house and played guitar for a while, which he adored! Music is useful for so many different things–relaxation, excitement, catharsis, and much more. However, right now I’m most interested in the educational properties of music. I remember as a child learning many things through music. The alphabet, my home address and phone number, aspects of safety, and more were all taught to me through music; through songs that I still remember and can sing. I fully plan on teaching Sam many of the same songs that my parents used to teach me valuable things, but I also intend to make sure he receives music lessons–and I might even join him. I have wished for years that I could play a musical instrument, something I wish I had not resisted when I was given music lessons in childhood. Music is the one art we all have inside. We may not be able to play an instrument, but we can sing along or clap or tap our feet. Have you ever seen a baby bouncing up and down in the crib in time to some music? When you think of it, some of that baby’s first messages from his or her parents may have been lullabies, or at least the music of their speaking voices. All of us have had the experience of hearing a tune from childhood and having that melody evoke a memory or a feeling. The music we hear early on tends to stay with us all our lives. Share some music with your child, and give them a song for the rest of their lives. Recently I talked about the importance of relaxation. However, today I want to talk about something that looks very different, but can frequently feel very similar: Flow. If you’re unfamiliar with the idea of Flow, it can seem very foreign, but its really a very simple concept. Flow is when you’re doing something you are good at and that challenges you adequately, and you do it until you lose track of time and whatever other needs you might have. You’re “in the zone”, so to speak. Music, art, sports, exercise, even (and perhaps especially) playing a game are all ways people regularly experience Flow. Flow is the meeting of high challenge, high skill, regular feedback, and pure delight. I think I’d like to add one more thing to that list of common Flow actions: Parenting. High challenge? Of course! Regular feedback? That kid is watching you all the time and letting you know how you’re doing through visual cues if not through sound. High skill? It may not always seem like it, but I think we’re probably better parents than we realize much of the time. Whether you’re rolling a ball with your 18 month old, playing superheroes with your 4 year old, building a science fair model with your 8 year old, or discussing the finer points of why a Zulu warrior would beat a medieval knight in full armor (should this natural and obviously historical battle ever take place) with your 16 year old, Flow can quickly and easily come into play. Of course, not all activities foster Flow. Those low skill and/or low challenge activities aren’t going to work. Take the time to develop interests in other areas and turn off the tv. Go out and experience Flow with your child today.